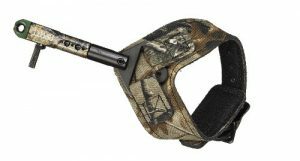 The Scott Shark release is a dual caliper solid swivel release that can be purchased with a buckle or a velcro strap. This release is fully adjustable via a 5 hole length adjustment system. This system allows any archer to set the trigger right where it has to be for proper form. As Scott Archery’s number 1 selling dual caliper release, the Scott Shark release has many great features. One of our favorite features is the forward positioned trigger. The trigger is closer to the the bow string which allows archers to maximize their draw length. Shooting the longest possible draw length while maintaining good form gives you a faster arrow so we love this feature. The trigger also has a sensitivity adjustment screw. This allows you to adjust the trigger pull for better accuracy. It was no surprise to me that this release delivered as every Scott Archery release has for me in the past. It has a solid quality build and when adjusted to your hand, works flawlessly and smoothly. At my archery club, I was watching a young man shoot through paper. He had decent form but had a couple hellacious rips. I noticed he was “plucking the banjo string” with the trigger of his release while shooting. I let him try the Shark release. Once properly adjusted, his rips started improving. In a short period of time he was shooting perfect bullet holes. He tried to buy the release off me on the spot but of course I told him to buy his own. 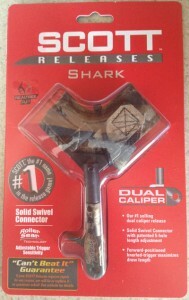 The Shark release is a solid performer and will accompany me at the range and in the field this year. For a release of this caliber to be priced around $70 makes it a steal. I give the Scott Shark release an 8.5 of 10 rating. Trigger pull sensitivity is adjustable. Wrist strap is made of quality components. The release could fold out of the way easier to allow quieter climbing of tree steps or ladders.